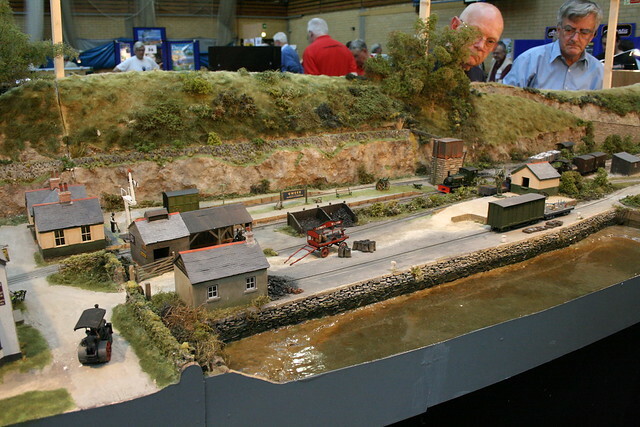 What seemed to be a trend at ExpoNG this year was for layouts with no backscene or just a very low one. In the case of Gweek North Quay the rising ground behind the tracks serves to act a kind of view break (and to cover the fiddle yard tracks) but any attempt to represent the sky or distant scenery is skipped over. 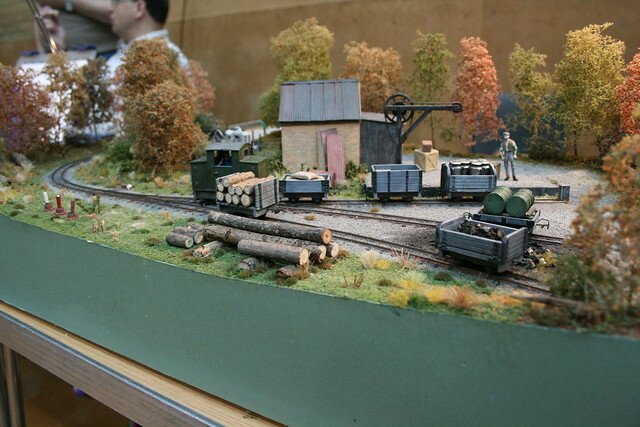 Black Hall Sidings, an 09 Inglenook shunting puzzle by Simon Andrews, uses a stand of autumn trees to draw attention into the modelled scene. The effect is at an extreme with Don Sibley’s Belgian Country Tramway, which is not only sans backscene but very flat and very thin. It is, I’m told, a slice of a home layout which can be brought out for shows but the result is something that is pretty hard to take photos of. 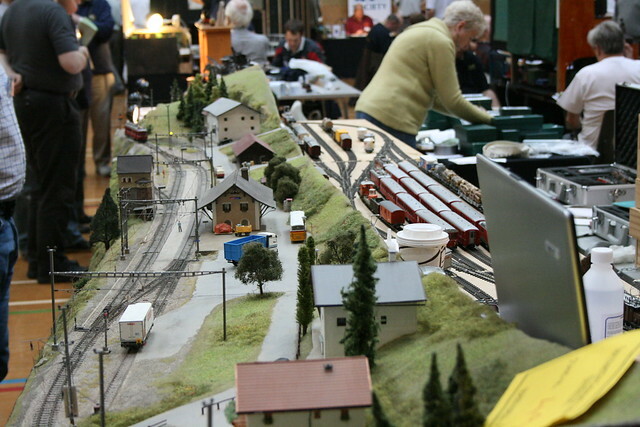 Not that the layout itself is any poorer for it as the rural Belgian village scenery is modelled very convincingly. However the layout which set this post in motion was Ardez in HOm by John Attewell. Again without any backscene but very well captured Swiss scenery, and based on a real location, John’s explanation was that he sees the layout as a three dimensional slice out of the world (albeit 87 times smaller) and therefore a flat panel of sky against one of the edges would be unnecessary. I can certainly see the logic, and I would have to agree that no backscene would be preferable to a poorly painted one. The other aspect of Ardez I wanted to write about, and visible in the open fiddleyard, is the laptop which runs the Railroad & Co. software that controls the DCC equipped layout most of the time. While I’m not sure that such a level of automation is something I would consider for myself (although the various iPhone interfaces for DCC systems that are popping up are tempting! ), in the case of Ardez with its efficient Swiss timetabling and fully working signalling it seems appropriate. It can also allow a single operator to run a more intensive service, with the computer filling in movements between the manual ones and the signalling able to prevent accidental collisions. 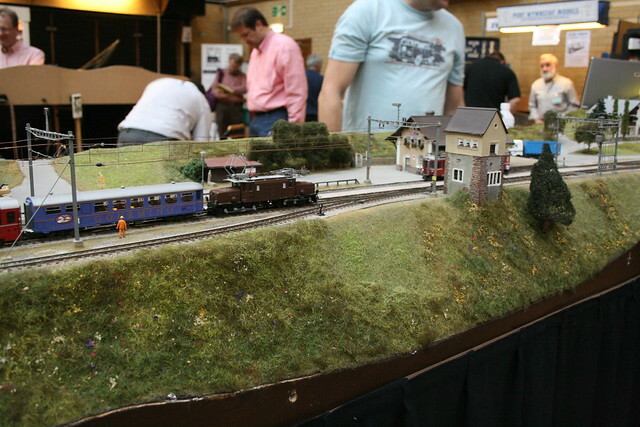 This entry was posted in backscenes, dcc, exhibition, expong, model railways, narrow gauge. Bookmark the permalink. I’d rather see a plain sky backscene than the operator’s belly, coffee mugs, and laptops in the photographs! Another vote for backscenes from me, I can see the intention of not having one but I don’t think it helps the overall effect of creating a landscape with a railway ‘in’ it. One thing I like particularly is the blurring of effects where, say, a grass edge to a country track or similar situation is portrayed. The old fixed lines between things were often unnatural but this homogeneous look is much more natural. And who can paint a convincing sky anyway? Where are the birds – and the power lines! I didn’t even notice that Gweek North Quay didn’t have a backscene. I did notice the lack of backscene on Ardez, and I was quite interested in it. I thought that the layout would have needed to be designed differently if it was going to have a backscene, as it looks like it would be very difficult to get a convincing join. I would imagine backscenes on alpine layouts are particularly difficult, as it would probably look wrong with the sort of haze which helps backscenes on British layouts recede into the distance. In general I’d vote for a backscene, and for an Alpine layout I’d class it as essential. 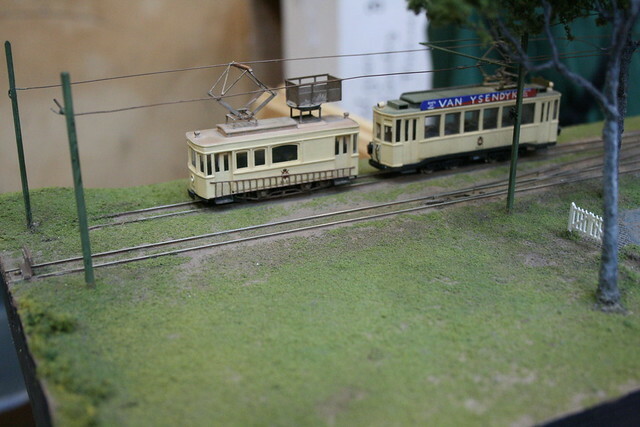 Looking at the Belgian tramway layout it’s possible for the mind to extrapolate the modelled scenery into more of the same and a flatland village scene results. One can’t do the same with the alpine layout as the foreground gives too few clues about the mountain peaks that must lie within eyesight. In this case a plain sky backscene won’t do either, but a very simple silhouette in a grey blue a bit darker than the sky tone would. I’m another vote for the backscene! If nothing else, it leads the eye into the scene, although I will agree that there’s little worse than a badly painted backscene, or the old Peco ones that you saw on every layout in my far-off youth! I like the Blackhall sidings layout very much and the trees do draw the eye in, but they seem way too small compared to the figure and destroy the illusion for me. I guess if the backscene is dispensed with, then extra care might have to be taken with other things that the brain will try to latch on to for “bearings”. I think that backscenes, when used right really do help with the overall feel of the layout. Sometimes though, they are not necessary and, I personally do try to see the fiddle yards at exhibitions and it is always interesting to see what the operating area looks like.